At a cursory glance, Crash Team Racing is a fun little kart racer expanding on the world of Crash Bandicoot. Look beyond the surface, though, and you’ll see an extraordinary game that pushed PlayStation beyond its limits, upset Mario Kart’s hegemony, and laid out the blueprint for Naughty Dog’s rise to the top of the video game industry. The year and a half that Crash Team Racing took to develop happened to be the pivotal time in the history of Naughty Dog. Fresh off the back of a successful Crash Bandicoot trilogy and in the early stages of talks with Sony about a possible buyout, the studio charted an unexpected course: to try its luck in a brand new genre and test out new ways to run a company at the same time. Against all rules of nature, a bandicoot became a guinea pig and the great experiment began. Today, almost 20 years later, Crash Team Racing’s legacy might not be immediately transparent, but it runs through everything Naughty Dog has done since, and it will continue popping up in everything it does next. Our guides through the development of Crash Team Racing are Andy Gavin and Jason Rubin, the duo of Naughty Dog’s co-founders and CEOs at the time Crash Team Racing was made, and Bob Rafei, the game’s lead artist. All three have since parted ways with Naughty Dog and established themselves elsewhere. Gavin is a novelist, Rubin works on VR games for Oculus, and Rafei runs his own studio Big Red Button Entertainment. This is their recollection of how Crash Team Racing came to be almost 20 years ago. "Where Would We Go Next?" “For me, Crash Team Racing was an unusual game in that I was a producer and overall tech supervisor,” says Andy Gavin. The late 90s were a busy time in his career. He jumped into Crash Team Racing straight from the all-consuming development of Crash Bandicoot 3: Warped, and immediately went on to lead the team on Jak & Daxter after. Out of these three outstanding games, CTR stands out as the only game released during his tenure at Naughty Dog on which he was not lead programmer. The game marks an important footnote in Jason Rubin’s career as well. “It was the first product that I directed without his [Gavin’s] help,” he says. But before anyone had to roll up their sleeves, Naughty Dog had to make what might have seemed like a difficult decision to move on from its bread and butter platformer games, and try its luck in a genre dominated by Nintendo. The truth is that the decision wasn’t difficult at all, and pretty much everyone involved in the project—from Naughty Dog employees, through the studio leadership, to the folks at Sony—was chomping at the bit to try something new. “We had come to the end of good ideas for Crash platformers," Rubin says. "Crash 3 had time travel. Where would we go next?” he says. The answer, in hindsight, seems obvious. Sony, now an established competitor of Nintendo, needed a symbol for PlayStation to rival Mario, the cutest mascot around. 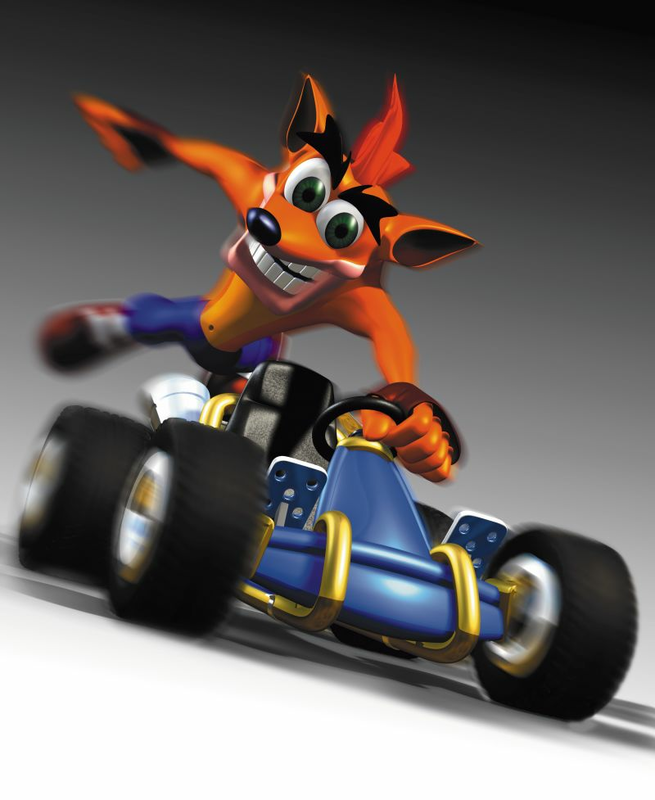 Crash Bandicoot was the obvious choice to fill that role, and headlining a racing game could confirm his crossover appeal. For their part, Crash’s caretakers at Naughty Dog needed a change of pace. Crash Team Racing was a match made in heaven for all parties involved, and the folks at Naughty Dog treated it as such. “There was a little concern among a minority,” Gavin says about the reception of the bold move to follow up three critically and commercially acclaimed platformers with a racing game. “But all in all the entire team was incredibly excited for Crash Team Racing.” He recalls that many on the team were fans of kart racing games, especially Mario Kart. This group was particularly amped up for the new challenge. The new game was also an opportunity to further develop technologies that the studio tinkered with in the “open view” vehicular sections of Crash Bandicoot 3: Warped. “It was both different, looked great, and incredibly fun even from early prototypes,” Gavin says about what made Crash Team Racing endearing to the crew. "We were at the peak of our understanding of the PlayStation." “It taught us the rhythm of having a small technical-design team build the early stages of the engine before the bulk of the art staff moved on over,” Gavin says about the lasting, internal legacy of Crash Team Racing. “If you put them on the project before the engine is sufficiently developed, they have nothing to do because the pipeline isn’t ready for that much content." The new system of rotating employees between projects helped streamline production and avoid bottlenecks. That, in turn, allowed Naughty Dog to deploy teams to work on new ideas which led to games like Uncharted and The Last of Us. The new workforce distribution might have revolutionized the internal workings of Naughty Dog but it couldn’t fix it. In many ways, the game industry of today barely resembles the realities of 20 years ago. Some of the biggest issues plaguing the industry two decades ago are even still prevalent and painfully evident in 2019. Employee burnout, tight deadlines, and lofty ambitions demanding hours upon hours of overtime—all of that sounds painfully current in our post-Red Dead Redemption 2 crunch debacle landscape. It’s a reminder that the industry has been struggling to address these issues for decades, and the solution is still nowhere in sight. While it was the people making Crash Team Racing who paid the utmost price of the aggressive development cycle, the game itself shown signs of wear as well. Or so claims Rubin. “We finished the game in an incredibly short time and kept adding game modes too late in development,” he says. The additional modes like the evergreen Battle Arena were a welcome addition, but they took their toll. Still, “nobody complained,” says Rubin. Time constraints aside, Naughty Dog enjoyed the challenge of adapting what made the Crash Bandicoot series a great platformer into a great racing game. Some parts of the process were essentially frictionless. 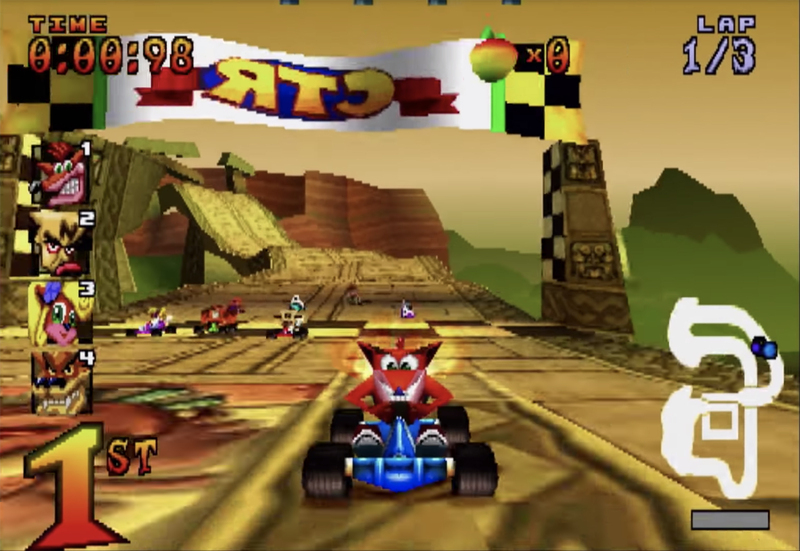 “The model for character kart games allowed for the otherwise incongruent mash up of the whole gang of characters–and from the three Crash games we had a huge stock of great personalities,” Gavin says. What caused Naughty Dog a much bigger headache was the technical limitations of the PlayStation. Few studios back in the day had the expertise Naughty Dog had working with the console. As Rafei says: “We were at the peak of our understanding of the PlayStation.” And yet, even with all that expertise, Naughty Dog barely managed to make Crash Team Racing run on Sony’s gray rectangle. “Technically, it was a ground-up new engine masterminded by the brilliant Danny Chan and with advanced assembly engine check by Greg Omi–all being driven under the ‘whip’ of Jason and Evan’s maniacal vision,” says Gavin. And for all its brilliance, the engine pushed Sony’s first console to its limits. “Doing the kind of smooth open environment 3D that Crash Team Racing pulled off was incredibly hard on the PlayStation–and four times as hard in split screen,” he says. “All of the challenge with Crash Team Racing, and it was huge, was creating a 3D racing game in the constraints of the PlayStation's hardware. That was a challenge we almost couldn't overcome,” says Rubin. He also offers an explanation as to what exactly made Crash Team Racing such a resource hog. Here’s where things get technical. “The first Crash games had cameras that travelled down a set path. That meant that we could use an incredibly complex overnight process that ran across an office of silicon graphics machines to reduce the draw list of polygons that drew nothing that wasn’t needed. It was the perfect list of polygons for any frame, and it allowed for textures and whatnot to be streamed in as the level progressed,” he says. On the other hand, “CTR was an open-world game from a camera perspective, in that the camera was free to follow the kart wherever it went. Because of that, we couldn’t stream as effectively and most things for a given track had to be in memory at all times,” Rubin says. All of that boils down to a fairly simple comparison. “The difference is that the Crash platformers looked like 3D games but were really very cool hacks that used multiples of PlayStation’s memory per level. CTR was a real 3D game and therefore relied on much more complicated real-time engine tricks and was crammed into the PlayStation. The difference was massive." Gavin puts it in even simpler terms. “The fact that you can play four player split screen fluid 3D racing on the PlayStation is staggering. That machine really wasn’t that powerful or that 3D,” he says. That last sentence should make us rethink what we know about Sony’s first console. It’s true that PlayStation ushered in the new era, but we rarely see that credit extended to the ingenious developers behind those revolutionary 3D games. The technology Naughty Dog developed for the game was ahead of its time by at least half a generation. After squeezing every last drop of juice from the original PlayStation, it made its way into the engine for Jak & Daxter on PlayStation 2 as well. 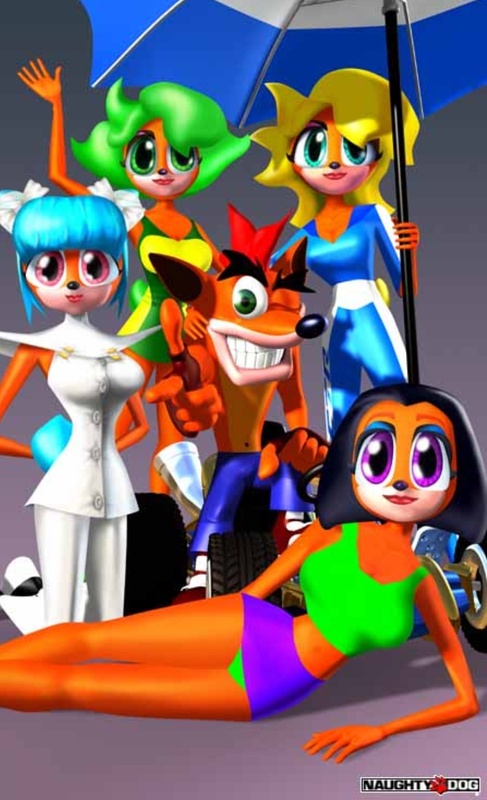 For his part, Bob Rafei also credits Crash Team Racing with giving Naughty Dog a better understanding of building open-worlds that seeped into Jak & Daxter. That’s a big legacy for a small kart game. But Naughty Dog hoped for more than just comparisons to Mario Kart. “We were standing on the shoulders of Mario Kart, and we wanted to make sure that we could differentiate ourselves,” says Rafei. One way to do just that was to find a unique twist while adapting the Crash gameplay into the new genre. The team accomplished that by translating all the jumping, running, and smashing of boxes from the platformers into a creative boost system. Crash Team Racing’s core mechanic was built, rather ingeniously, around stringing together powerslides, boost pads, power-ups and jumps into a steady supply of precious nitrous oxide. One of its key ingredients was Hang Time. Inspired by the NFL statistic measuring how long the ball is suspended up in the air, this gameplay mechanic revolved around a simple idea: the more time you spent with your wheels off the ground, the bigger the boost upon landing. “The boost system we employed was, in my opinion, more challenging and rewarding than the previous Mario Kart systems,” says Rubin with pride. And, as some may argue, he's right. Rafei draws my attention to yet another feature of Crash Team Racing that would probably make designers at Nintendo proud: its accessibility to gamers of all levels of skill made possible by the clever AI of fellow racers. The game, Rafei says, had “a kind of rubber banding effect making sure that you could still have fun even if you were a terrible player or still be challenged if you were an advanced player.” In other words, it never made you feel too secure in your lead or lagging too far behind the competition. The difference between winning or losing in Crash Team Racing was usually measured by mere seconds or one (un)fortunate draw of a power-up. “That's a bit of a controversial thing in the games industry, but I felt that it was just such a fun game,” Rafei says about that system. And, for what’s it worth, he claims that to this day, Crash Team Racing is one of the very few old games able to impress his kids. "You always worry about every game. You're a nervous wreck." Jason Rubin, who gives the aura of a pragmatist, has one big takeaway on his time developing Crash Team Racing: “It taught me that repetition gets old quick in single-player games, but is a basis to build competition in multiplayer games.” Today, this conclusion might seem obvious, but it’s no less essential than it was 20 years ago when competitive games were still trying to hit their stride. With these words in mind, it’s hard to look back at Jak & Daxter, Uncharted, The Last of Us or to look ahead at the upcoming The Last of Us: Part 2, and not see the reflections of Crash Team Racing under the surface. The games Naughty Dog worked on in the last 20 years may be as different as they come, but they all trace their lineage back to the decision to strap Crash into a go-kart and see where the road would take him. 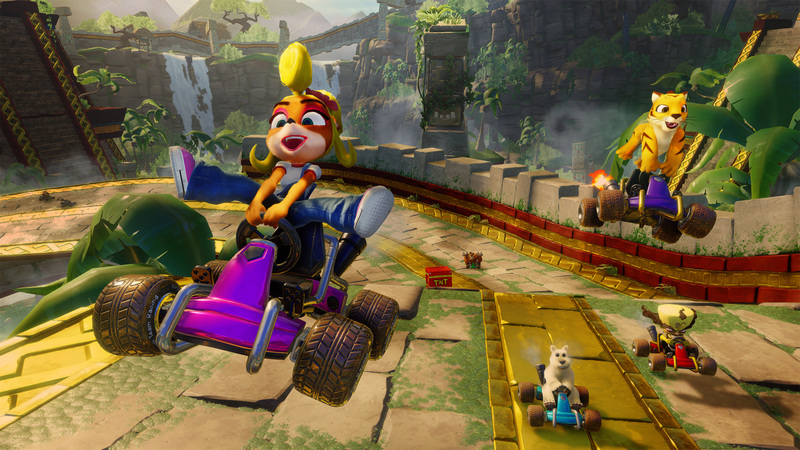 Two decades later, the finish line is still to be seen as the upcoming remake Crash Team Racing Nitro-Fueled from developer Beenox drifts into view, while Naughty Dog prepares to launch its most ambitious game yet. Here’s to the next 20 years on the road being as exciting as the route that got us here. Tagged with Naughty Dog,	PlayStation,	Racing,	Retro,	Retrospective,	Sony.